Nectar of Life: Losing your lower body? There are many villages around our city Belgaum and we get workers from the surrounding villages. I used to be astonished at the frequency with which these villagers got hospitalized, went under the surgical knife and got long term medications. Because according to me, they were leading lives closer to nature. They bring children with many rotten teeth, we feel really sorry to see that. For one thing, they can't eat properly, depriving the body of essential nutrients, stunting the general growth. Secondly, since they cannot chew properly, there is not enough exercise for the jaw muscles, retarding their facial growth, which affects the personality. This is because biscuits and breads are easily available in the shops and kids like to have them, with a preference over the chapatis. These stick to their teeth and they don't have proper brushing habits, leading to dental decay. But recently I became aware of another serious problem regarding the lower part of the body, which is crippling many and causing constant pain. There was a religious meeting in an adjacent village, about a dozen chairs were arranged for some VIPs to sit in the front. It was expected that the villagers will sit on the floor in front of the dais. To the horror of the organizers, they were told that the local people can't sit on the floor and they had to somehow arrange about 80 chairs immediately. No wonder many of them get arthritis at early age. I couldn't think of the reason why these sons of the earth couldn't sit on the floor, because we Indians are known to be able to sit in sukhasana and padmasana. The habit of squatting is disappearing even from the villages! Our grandmothers used to cook sitting on the floor and meals were eaten sitting on the floor. Sleeping on the mats necessitated bending the knees, using the hips and ankle joints. Daily puja were done sitting on the floor.Now we have raised platforms for cooking and doing puja and cots for sleeping. 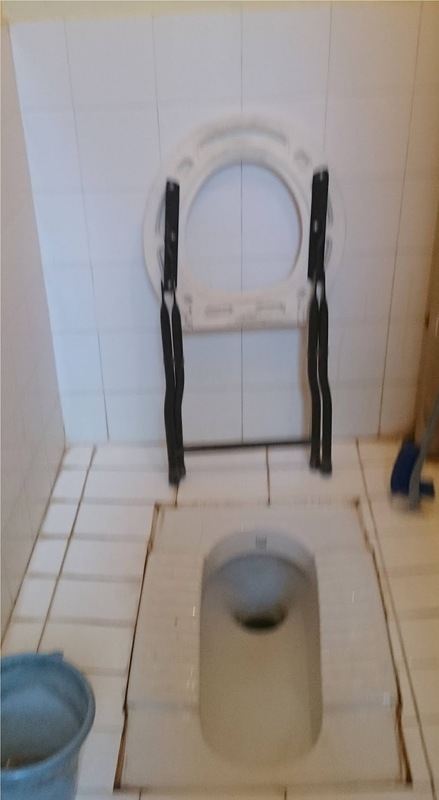 Another interesting finding was the presence of a chair in a bathroom. Instead of sitting on a low stool and taking bath, now a high level chair is preferred to sit and taking bath. 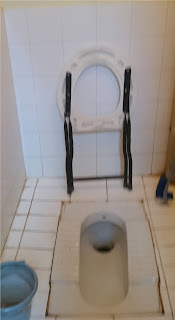 The bucket of water is kept over another stool so that bending is not required to take the water. In short, people have stopped using the lower half of the body. I wonder whether the Nature will do away with this area of the body for humans during the course of evolution!